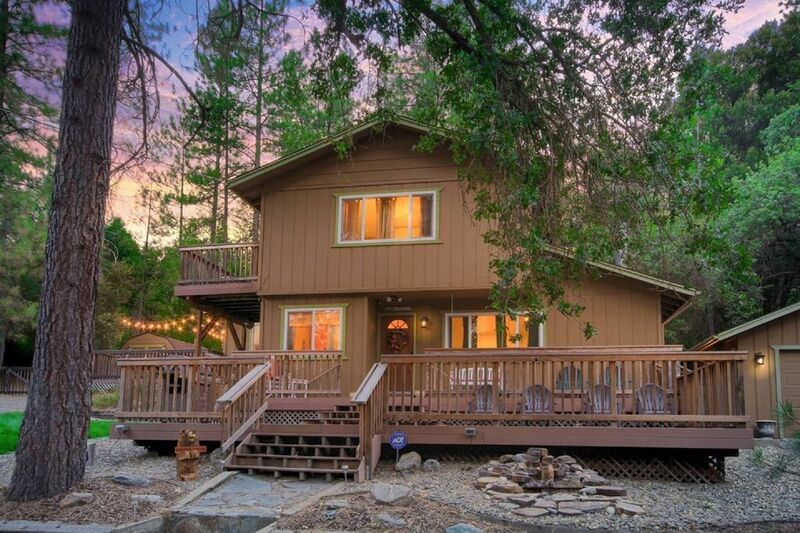 Amazing custom built home in Mariposa, the gateway of Yosemite. Perfectly situated in a Beautiful Tree Studded setting, this is the perfect place for your family or group to connect in this world class destination. This beautiful home in the mountains is the perfect getaway or place to unwind at the end of the day! It has been lovingly cared for and kept in pristine condition inside and out. From the house, you look out at the mountains and trees for a dramatic view. Sit on the porch and enjoy the mountain views and sounds of our running water fountain and the natural sounds of birds. Recently remodeled with many nice features including, all new central heat and air, all new kitchen with granite counters and stainless sink, dual-paned windows throughout, new carpet and new wood stove. Amazing Mountain Area with the smell of Juniper all around ! Yosemite Park is easy accessible (travel times can vary depending on traffic and road conditions). Also those with 4 wheel drive or suitable vehicle can also enter the park thru Harris Cutoff Road/Chowchilla Mountain Road which is even more direct. To see more photos, get some super helpful local information and a plethora of helpful facts about Yosemite, the seasons etc. and our other Vacation rentals here in Mariposa you can find us on the web by searching for BnBYosemite. Beautiful Home in the Mountains !! This home was top notch with all the amenities a family could ask for. Super convenient to Yosemite, it was a joy coming back to this house after a day at the park. The owner has pulled out all the stops with a great game room for the kids and a luxurious hot tub spa for the adults. We will definitely be back. Spacious lodge, Beautiful and serene. Felt like we were inside Yosemite. Loved, loved, loved this vacation home. Not only is the house top notch with every amenity you could ask for (hot tub and game room) but it’s situated right on the backside of the park - it almost feels like you’re right there. We will definitely return!! Awesome, quiet house with great features at a great price! Great place to stay if you're exploring Yosemite and surrounding areas. The hot tub is amazing. The game room is pretty cool too but there was an issue with the shuffleboard. Not sure if it was the salt or the wood but the discs wouldn't slide very well :( We made due with the dartboard and foosball though! Rooms were homey and spacious. The wood burning stove is awesome. Would definitely stay again and recommend to anyone looking for a nature getaway with modern conveniences. Such a beautiful setting. My friends and I loved everything about the house - we actually drove through a back entrance to the Park which was awesome. Chilling on the deck and the in the massive hot tub were the icing on the cake. After an amazing day in Yosemite we were greeted to a lovely welcoming home. The house was clean and well equipped with everything we needed to fix a nice dinner for our group. We enjoyed the game room and hot Tub after dinner and watching the stars. It was incredible. Perfect end to a nature filled day. Even saw a mother deer with twins. There was plenty of room for all of us and we slept well. Wish we could have stayed longer! !